The Canon Diaries are ongoing explorations of Johann Pachelbel's famous chord sequence, as taught in the Musicarta Canon Project. Canon Diaries are principally for keyboard players who have worked through the study programme. Whether you are working from the music (MS) or trying to work a piece like this out by ear, your first move should be to try to see/hear the simple elements underneath the fancy ‘realization’ (performance). You would then try to master the syncopation of the right hand only. Comparing our ‘essentials-only’ MS with the performance MS, you see that beats three and four in the right hand are anticipated, that is, dragged forward a quaver off the beat. The last note in the first line is even dragged forward across the bar line. The audio/MIDI files demo just the first four bars, repeated. Practice tip: Load the MIDI in MidiPiano, select Repeat, adjust Speed and play along until effortless. Then add next four bars for the whole first phrase. Mastering the syncopation one hand at a time is the efficient way to work! Be aware of the temptation to skip these build-up steps. Next, look at the left hand (just look!). The counting tracks only the left hand notes. Counts in brackets, e.g. (2), indicate where a note isn’t played. Eliminating the tied notes, we see there are only left hand notes played on counts 1 &, & 4 &. Hopefully you spotted that this rhythm is used for virtually the whole of the piece. It’s much more efficient to learn a pattern – a template – and pour the notes into it, than to learn a whole string of notes one by one. Listen to the practice speed audio and count the left hand out load. Practise the left hand movement on your desktop using fingers 5 and 1. Loop the audio in Audacity to give yourself time to ease into the rhythm. Try playing the left hand under right hand crotchet chords. This is great syncopation practice for all your modern-style playing and will free your left hand to play off the beat in many circumstances. The music above leaves all the tied CD 13-06 left hand notes out. In practice, the CD 13-06 left hand is played as ‘sticky’ as possible, that is, both notes are held for as much of the time as possible and only come up to be played again. Music accurately showing the desired note-lengths is even more difficult to read. The audio is the first phrase of the actual performance. Practise your listening skills on the left hand (bass) part and see if you can ‘spot the difference’. In general, syncopated popular-styles music is more difficult to read than classical music – that’s why Musicarta offers so many alternative ways to learn. 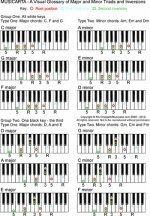 The MIDI files for all the music shown (plus the MidiPiano player) are included in the digital home study download. The next step in to work out ‘what comes with what’. Musicarta calls this TLR (together, left, right) analysis, and it’s a crucial step in mastering syncopated two-handed playing. Here is the first section with the TLR analysis sketched in. The counting now tracks the notes in both hands. Note: This is a look-and-learn exercise, to be performed away from the keyboard..
You see immediately that in the ‘typical’ bars, only count 3 doesn’t have a note on it. Also, despite what the music looks like (and what you think you hear), there aren’t many ‘T’ (together) ‘events’. Abandon the rhythm entirely as you try to get your performance going. You’re only interested in getting the right together/left/right ‘events’ in the right order (with the right notes). The rhythm can wait until your muscles are happy with the TLR sequence. Here are the first four bars (first line of music above) played TLR, without rhythm. When you can play the typical TLR sequence, gradually speed up. Work on just the first two bars. If you then make the fourth note in the bar (the second ‘R’) longer, it will spread over into the ‘nothing-happens’ count 3, and you will have the rhythm too. Load the MIDI file into MidiPiano, set the ‘Repeat’ function, use ‘Speed’ to slow it down to a comfortable speed and play along. Listen critically to tighten up your performance. If at all possible, tap your foot to the beat as well. Perform this ‘dissect and build up’ method throughout. Pencil in the counts and the TLR analysis on your hard copy. It doesn’t have to be neat or even right – making a focussed technical effort is what gets you there! Here is the CD 13-06-12 chord sequence. The overall form is AABA. The extension of the Canon chord sequence to something approaching song length – by inserting a contrasting ‘B’ section – is discussed in the Module 16 of the Canon Project proper. Being aware of overall structure is an essential part of songwriting and composing. The original Canon Diaries 13-06-12 entry was AABAA form. You might still prefer that – it’s another eight bars of music, as well! Slash chords. A chord symbol such as A/Cí indicates that a note other than the root (name-note) of the chord is being played in the bass (by the left hand). The example given (A/Cí ) indicates an A chord with a Cí in the bass. Bars with two chord symbols and a colon in the middle (e.g. D :G/D) indicate a bar that is split between two chords. The example given indicates a bar split between a D chord and a G chord with D in the bass. Suspensions are showcased in CD 13-06 as a device to generate music, and to ‘sell’ suspensions as a technique in your own composing-at-the-keyboard. You can experiment with pulling any chord tone up (or pushing it down) a scale step. Where suspensions occur on the main (first) beat they are indicated sus/res. Where they occur on any other beat they are indicated (s–r) (skeleton music only). Suspensions here means any ‘accented non-chord tones’, including notes below the chord tone they resolve to (‘accented lower auxiliaries’) for example the accented Cí in G chord, bar 33, which resolves up to note D.
More detailed discussion of suspensions can be found via the Suspensions tab on the Musicarta site navbar and on the Mister Musicarta YouTube Suspensions playlist. Suspensions are a great way to get more songwriting ‘mileage’ out of chords, and focussed study will also develop your playing-by-ear. Notice that there are only two chords in the upper part (right hand) – G and Fím. They ‘keep coming’ because the music cycles down through root position, second and first inversions of the alternating chords. In performance, the chords are broken up T B M T (top, bottom, middle, top). This pedal point material keeps the tension up because the G chord over A is essentially an A7sus chord. The whole phrase actually only ‘resolves’ to A7 the very last chord – and that in turn cadences to the tonic D chord. There is more pedal point material in CD 13-06 at bars 35 to 38, first over bass A, then finally over tonic D. Check the MS in the Canon Project home study download.